After a couple of days in El Calafate, Jason and I hopped on a 3-hour bus ride to the less-visited sister town, El Chaltén. 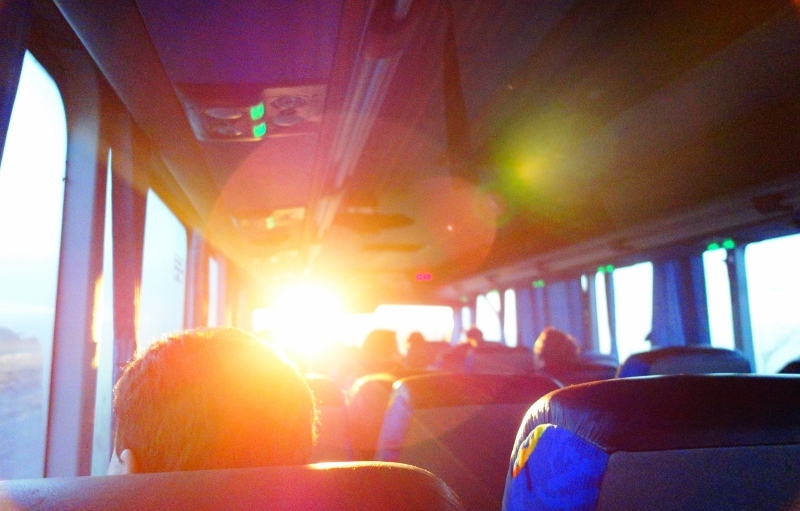 There are three bus companies that bring you from El Calafate to El Chaltén. 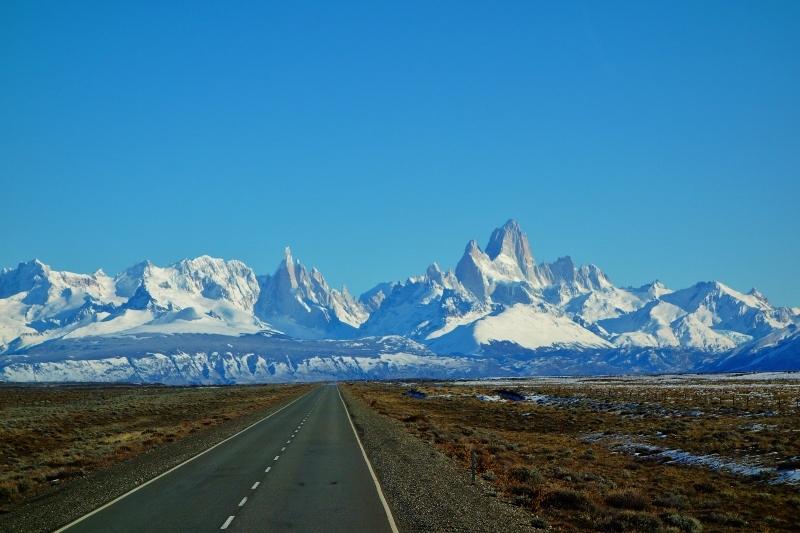 First, they stop at the tourist centre in El Chaltén and then at the town’s tiny bus terminal. 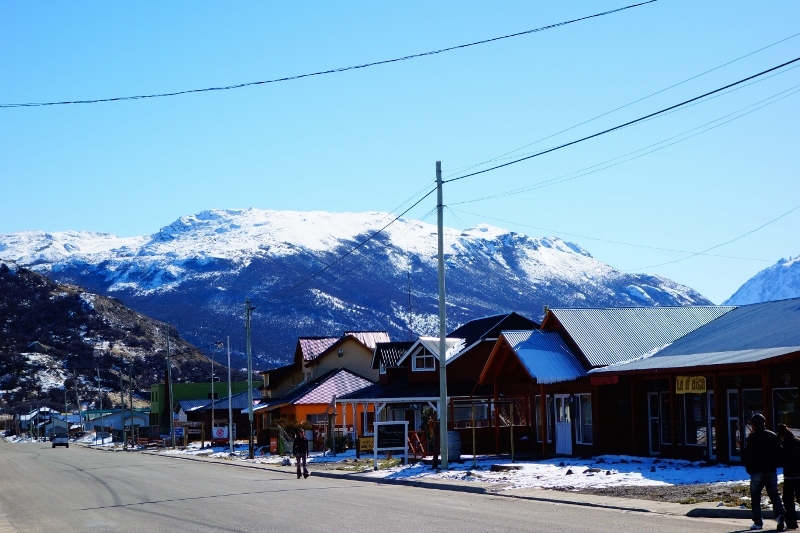 The sole reason for El Chaltén’s existence is tourism and even during high season, it’s a pretty isolated little town. 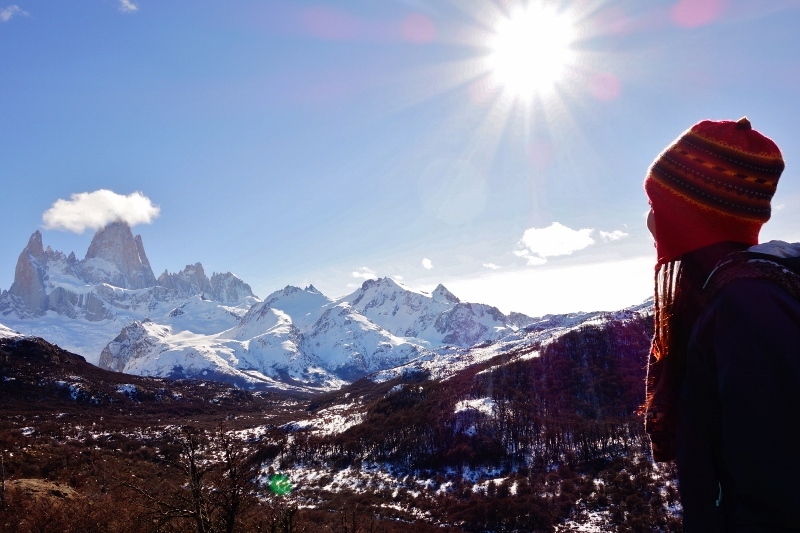 It’s the self-declared trekking capital of Argentina, and is the gateway to amazing climbing and trekking territory. 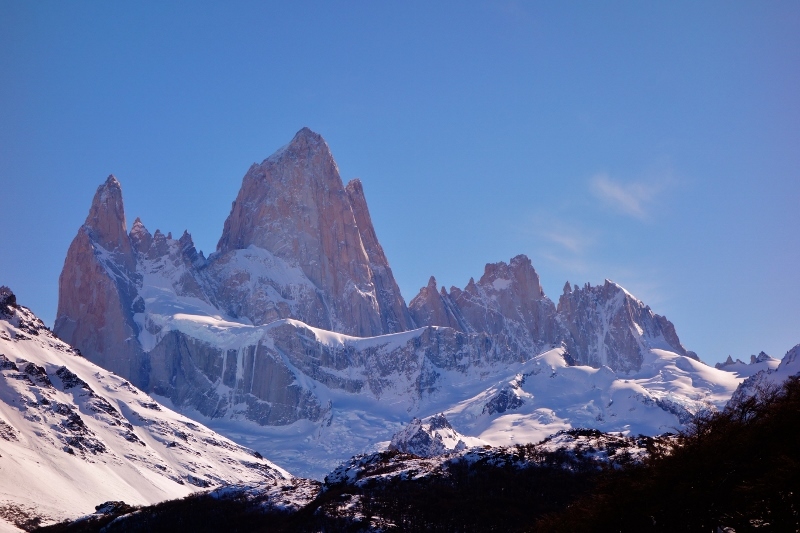 It provides fairly easy access to the famous Cerro Torre and Cerro Fitz Roy mountains. 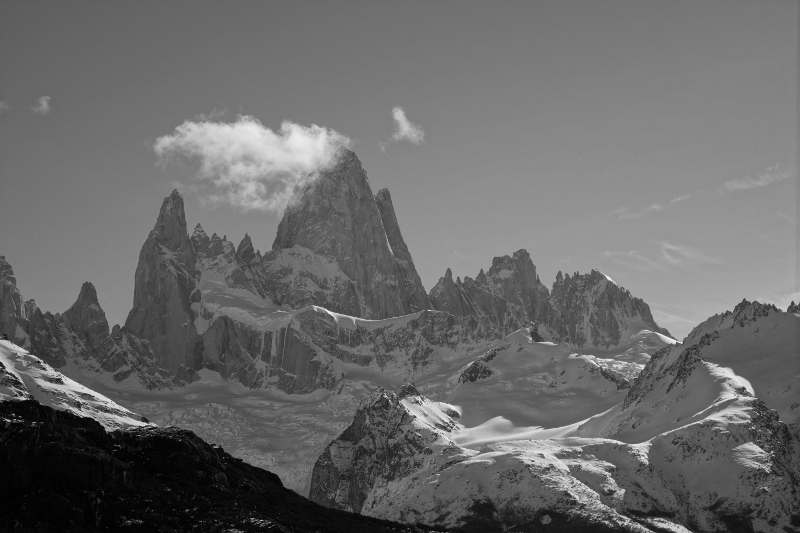 Those who are familiar with the Patagonia clothing company might find the mountain range here familiar-looking – the highest peak in the company’s logo is Fitz Roy. One catch though: since we were visiting during the off-season (Argentina’s winter months), the town would likely be almost deserted. We had read that most accommodations and restaurants would be closed for the season, so we were a little wary coming here. 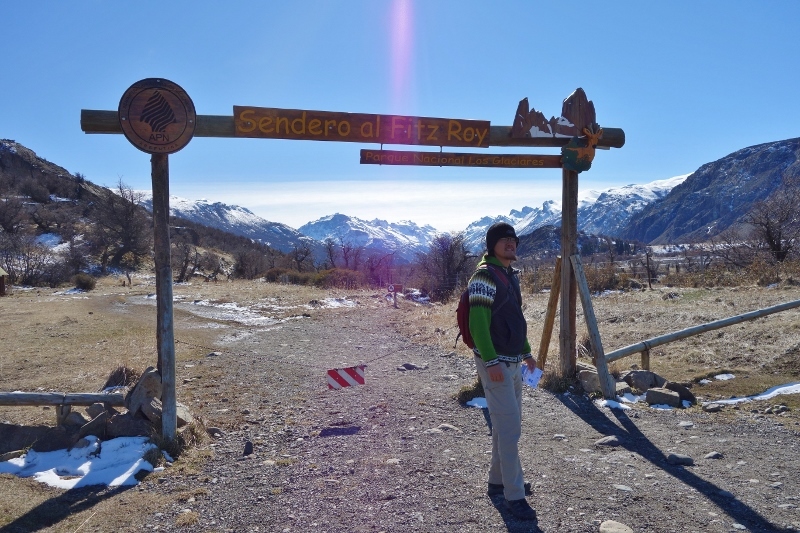 However, the California couple we met at Perito Moreno Glacier gave us a great tip on where to stay since they had just come from El Chaltén. 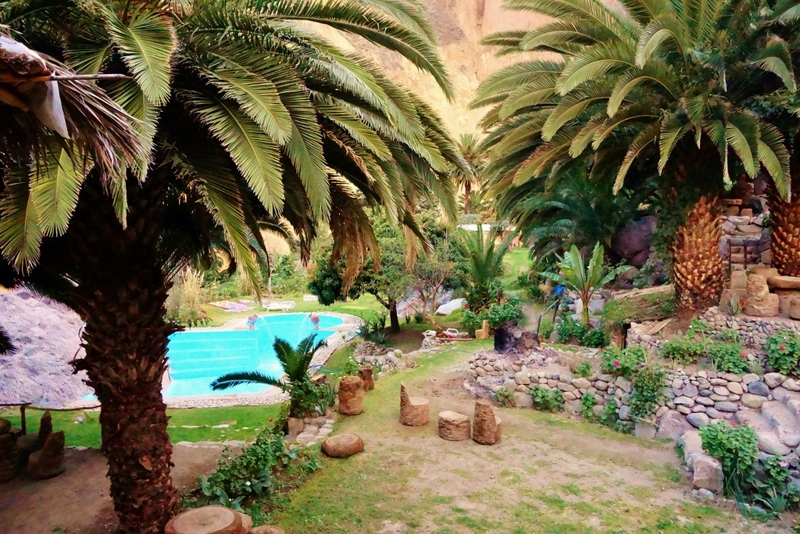 Upon arrival, we discovered that – in the whole town – there were two hostels and one restaurant that were still open. Their local market was also still open so we ended up spending the next four days making our own meals in the hostel’s well-equipped kitchen. I loved our time there. It was quiet, relaxed and peaceful. The town was a charming little place full of smiling locals and, since it was off- season, almost no tourists. 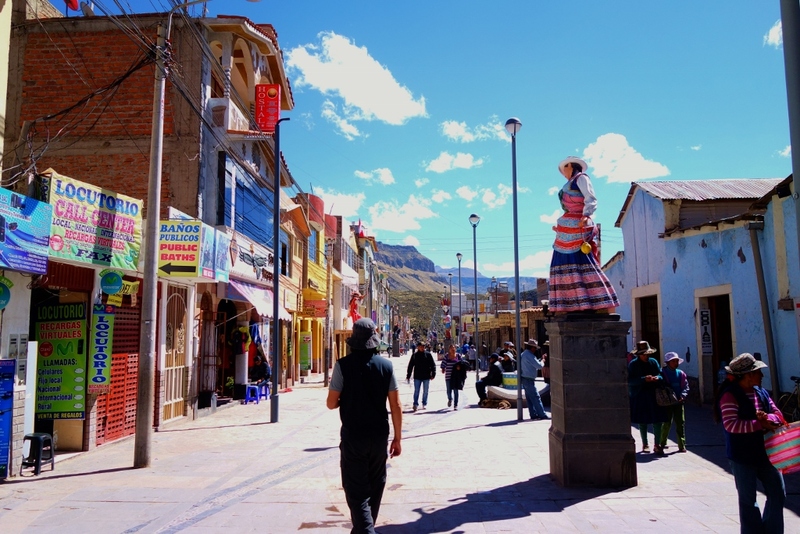 We arrived on a brilliantly sunny day and the friendly guide at the town’s tourist centre made sure we understood how lucky we were – calm, sunny days were rare during the winter. 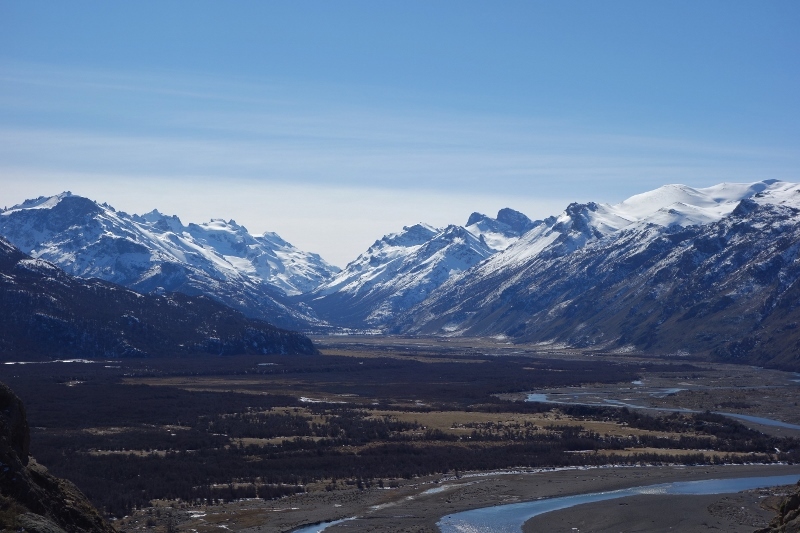 Many travellers who arrive here in the winter never even get to see the mountains because of the snow and clouds. 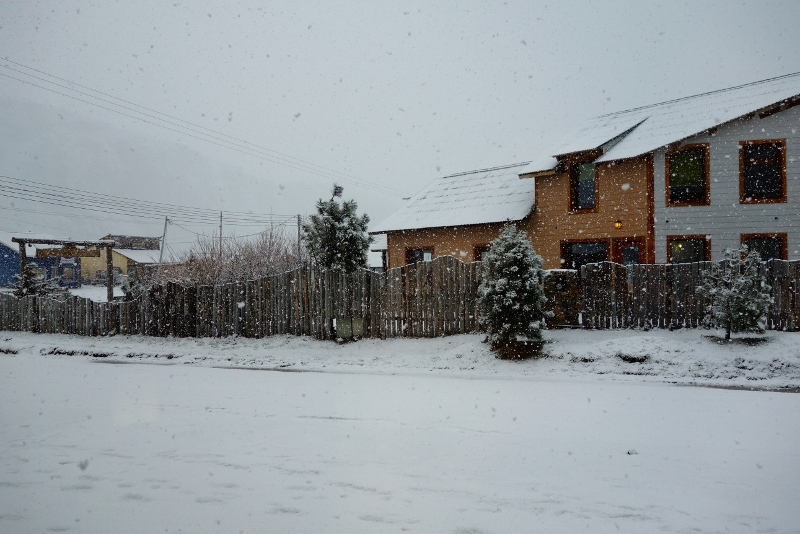 With the exception of the two sunny days, El Chalten looked like this for the rest of our stay. Unfortunately, I was trying to get over a pretty bad cold so we “wasted” the sunny day by staying indoors. Luck was on our side though, because I got up the next morning (rested and feeling much better) and was greeted by another sunny day. And we weren’t going to waste this one. We had chosen the slightly shorter hike (3 hr), which took us to the nearby lake (lago Capri) and look-out point near Fitz Roy. We arrived at the lake to find it completely frozen over and covered in a blanket of snow. There were signs everywhere that warned us not to step on the frozen surface but there were footprints all over the lake, so it seemed pretty safe. 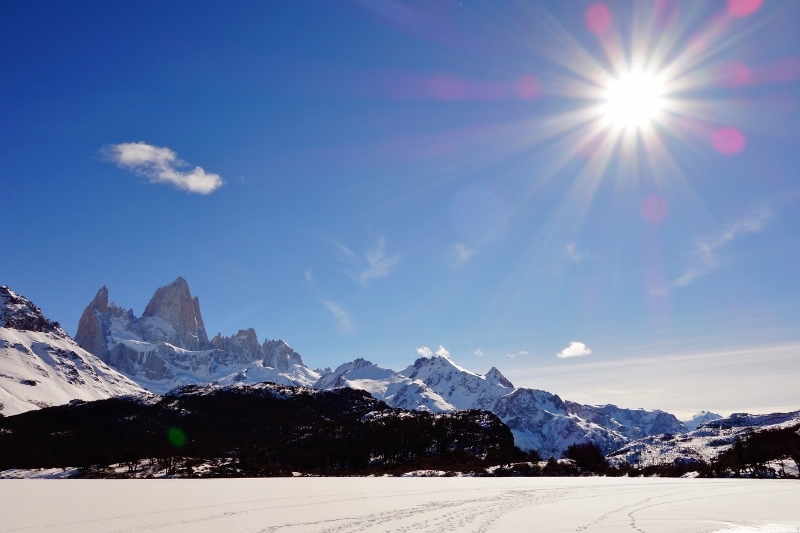 The view of Fitz Roy from the lake was magnificent. Again, we were so lucky to have such amazing winter weather – couldn’t have asked for a more perfect day. 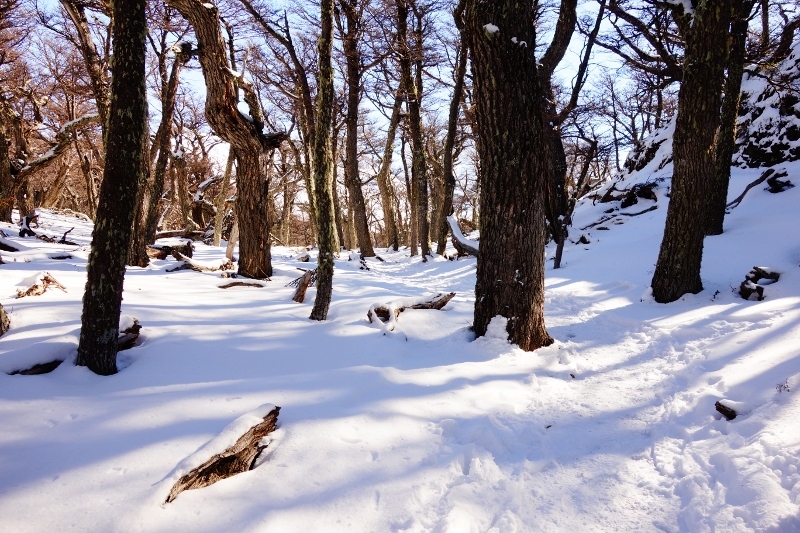 Hiking in Patagonia was an awesome experience – the scenery is unmatched by anything else we’ve seen in South America. 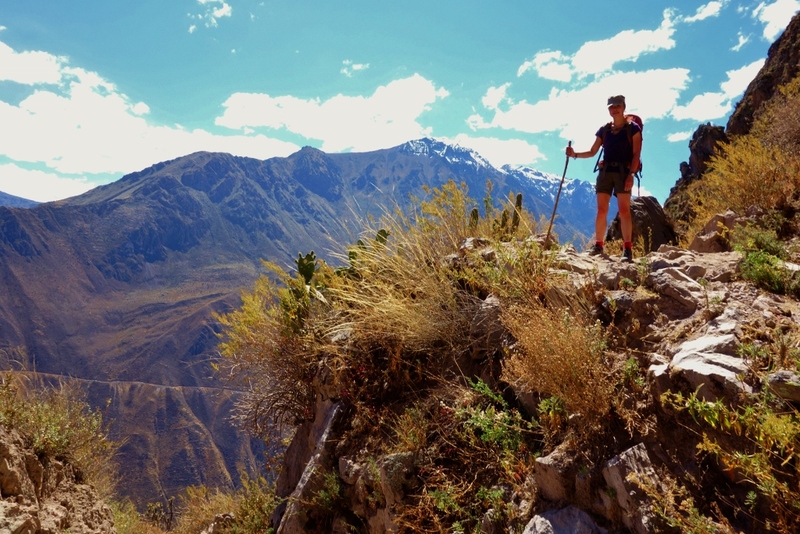 After a restful week in Arequipa, we were ready for another beat-down trekking adventure. 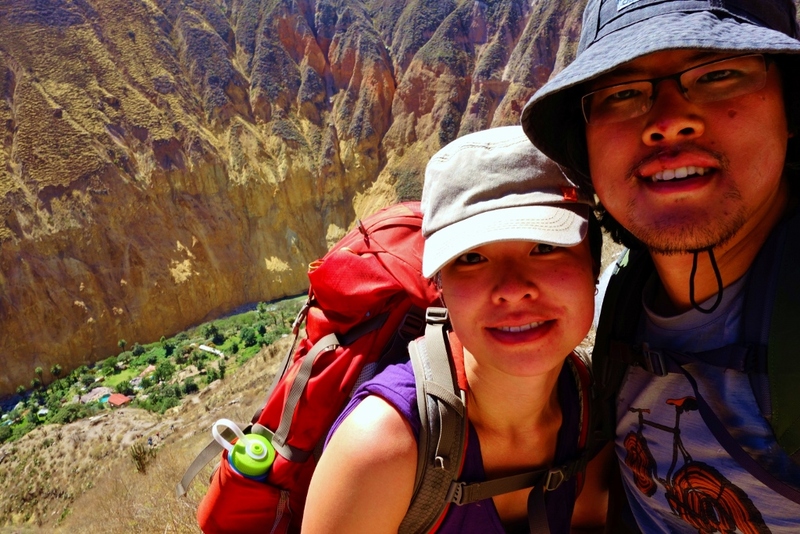 Arequipa is a main launching point for the surrounding canyon country and Jason had been itching to trek the Colca Canyon, which is about 200km north of Arequipa. 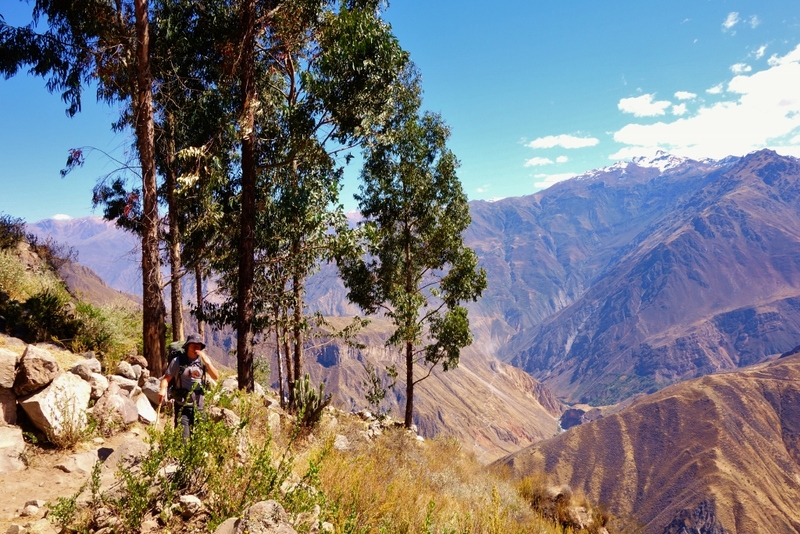 The Colca Canyon is one of Peru’s spectacular natural sights, although it’s often overshadowed by the country’s other attractions (i.e. Machu Picchu). 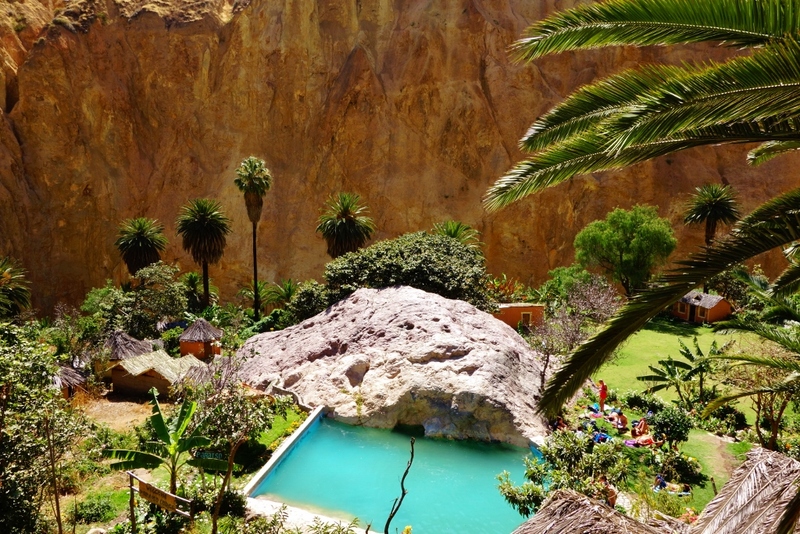 It’s twice as deep as the famous Grand Canyon in the United States and is actually the world’s second deepest canyon – just few kilometers shallower than the nearby Cotahausi Canyon. 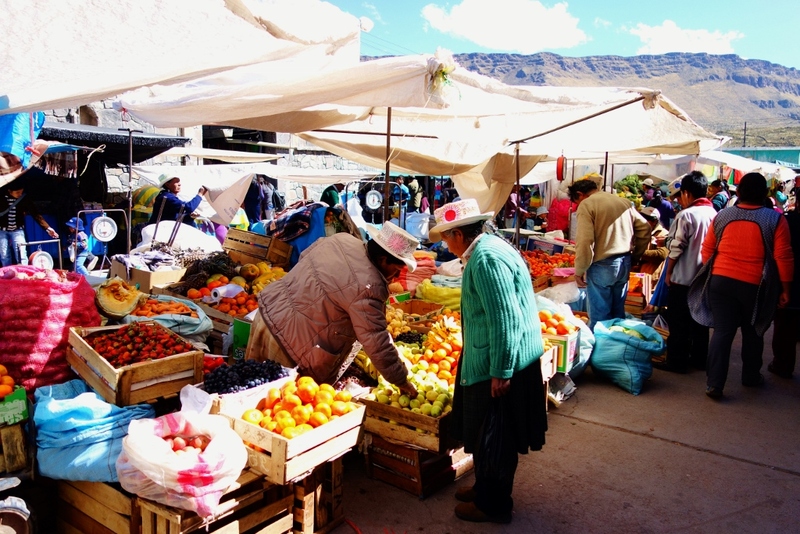 We decided to set up our base in nearby Chivay, a popular market town that still retains a lot of its traditional country origins. 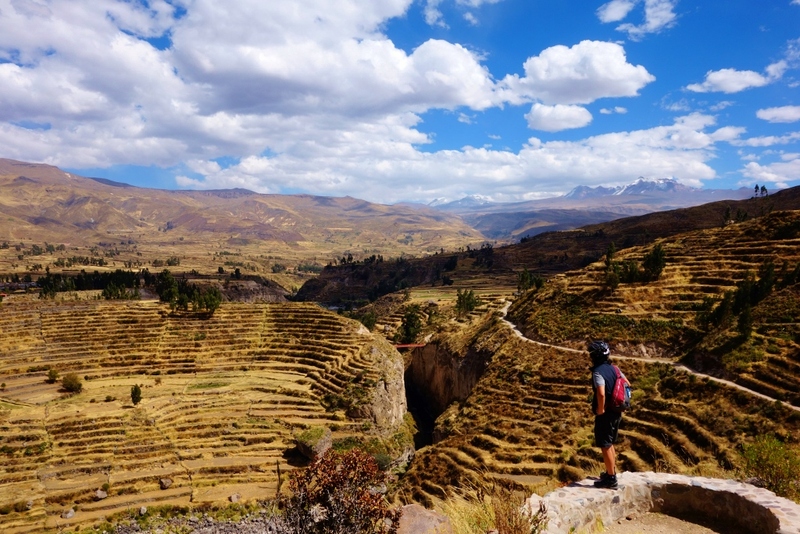 It’s a logical entry point into the canyon country, and holds it own with many hiking trails and some of the most impressive and expansive Incan farm terracing on the continent. 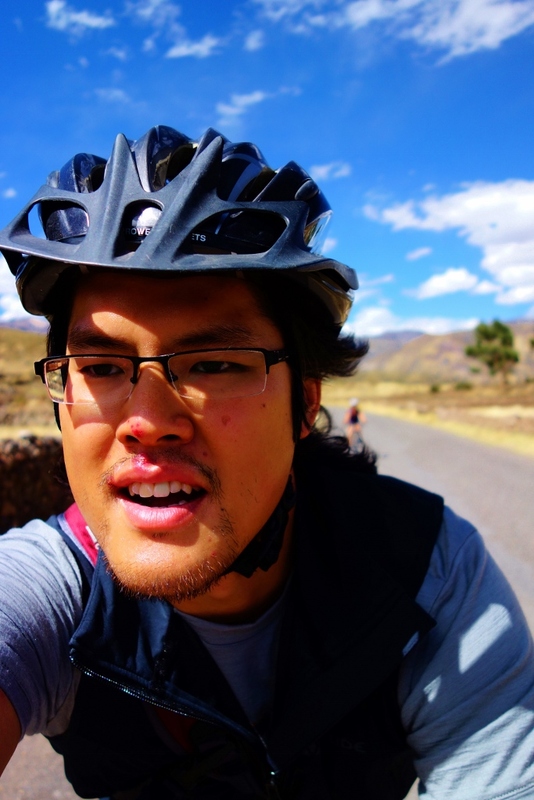 We spent our first day in Chivay on rented bikes, touring the surrounding smaller towns further up the valley. 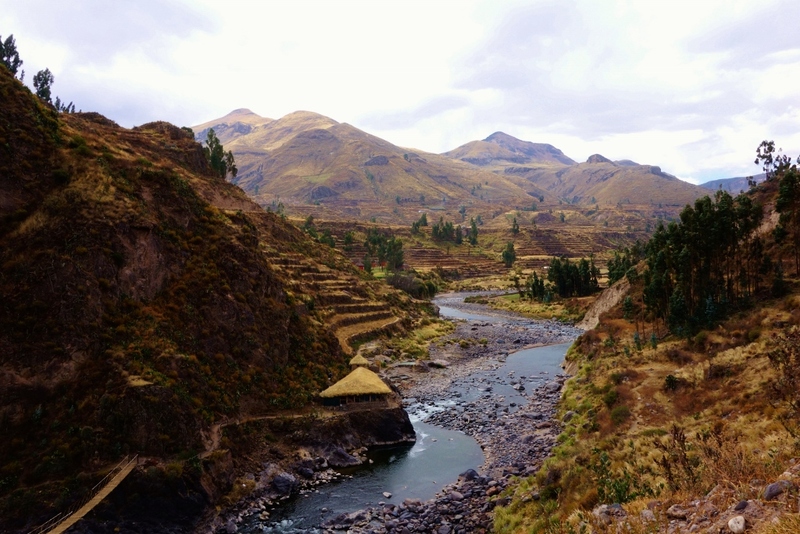 We started off making our way to the nearby town of Coporaque. There are a couple of ruins in the small town but we didn’t stop long. 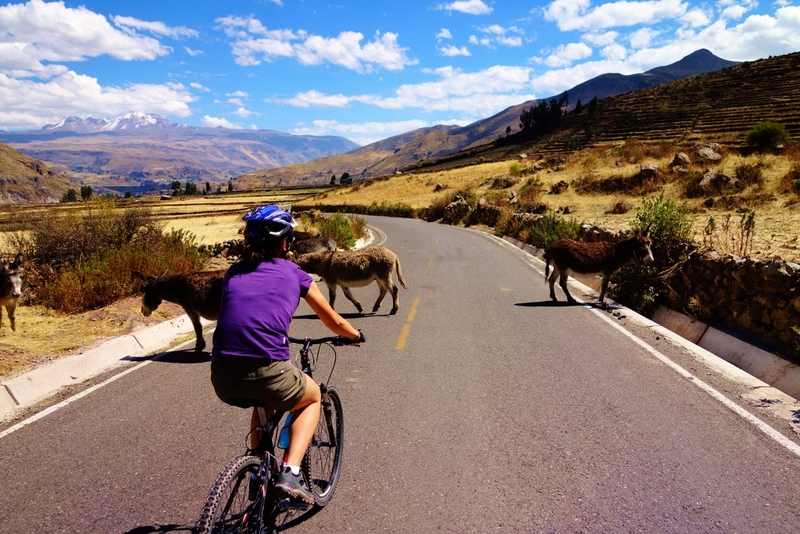 Out of Coporaque is a (mainly) downhill ride to the orange bridge which crosses the Rio Colca and brings you into Yanque. 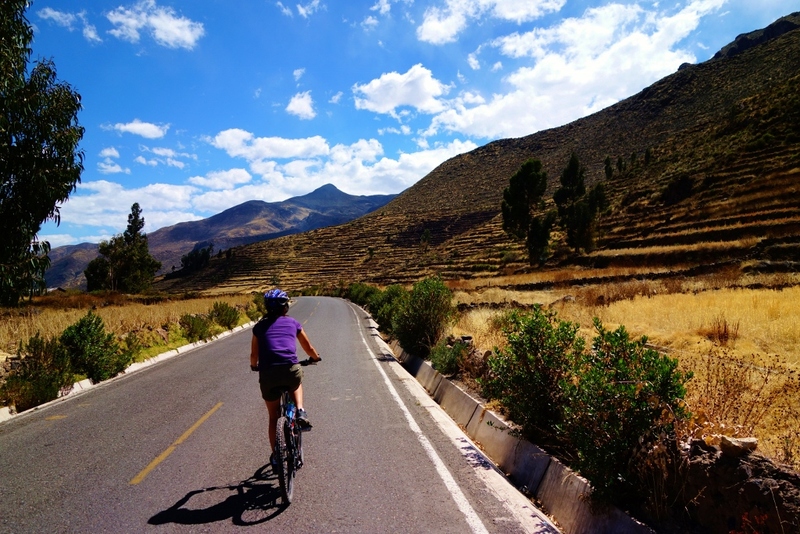 Unfortunately, the downhill out of Coporaque meant a crazy uphill from Yanque back to Chivay. My thighs are burning just thinking about it. Just a warning to non-bikers: it is NOT a quick ride. We were told it’s a quick 2-3 hours bike tour. We took about 5-6 hours because we were not anticipating the intense uphill riding (i.e. walking our bikes uphill) we encountered at the end of our circuit. Biking and photography at the same time! 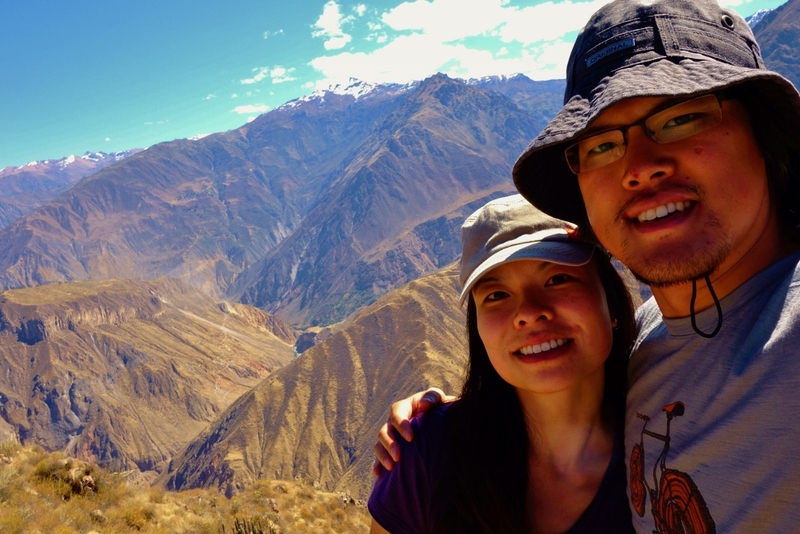 Successfully warmed up, we embarked on our 2D/1N trek into the Colca Canyon the next day. 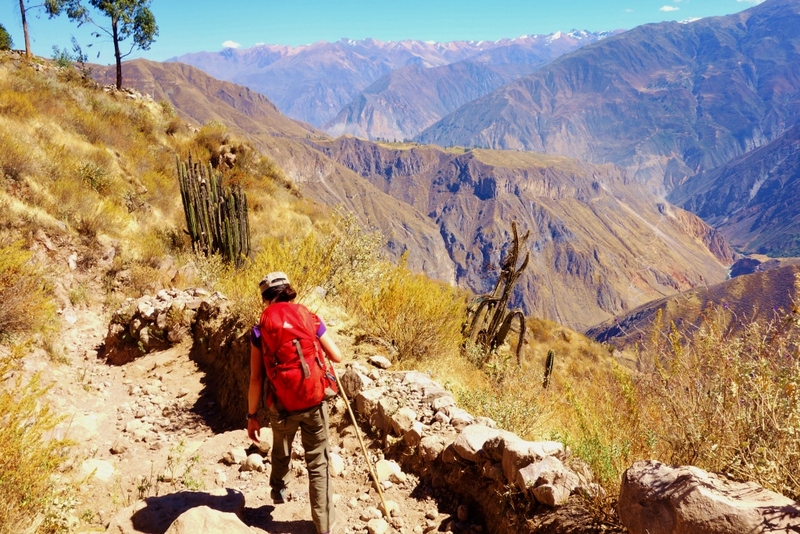 Although almost all tour companies in Chivay offer Colca Canyon treks, it’s pretty easy to do the trek solo. 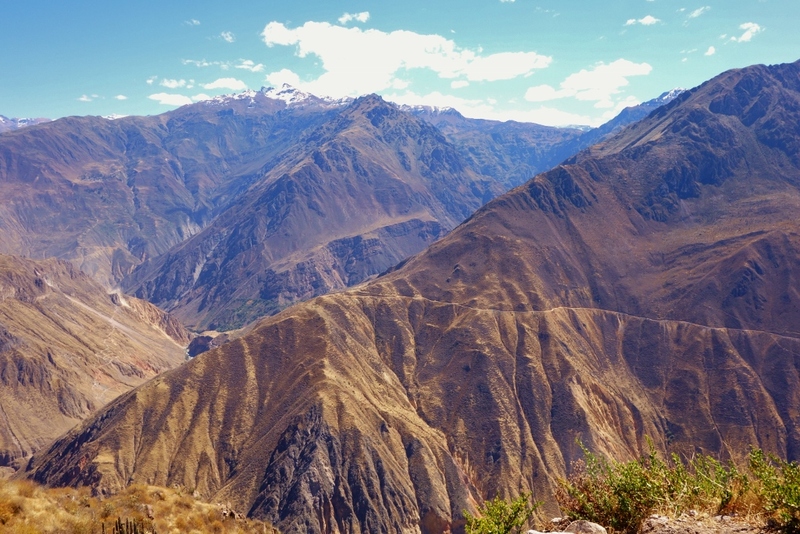 To properly experience Colca Canyon trekking, you have to make it as far as the little town of Cabanaconde. 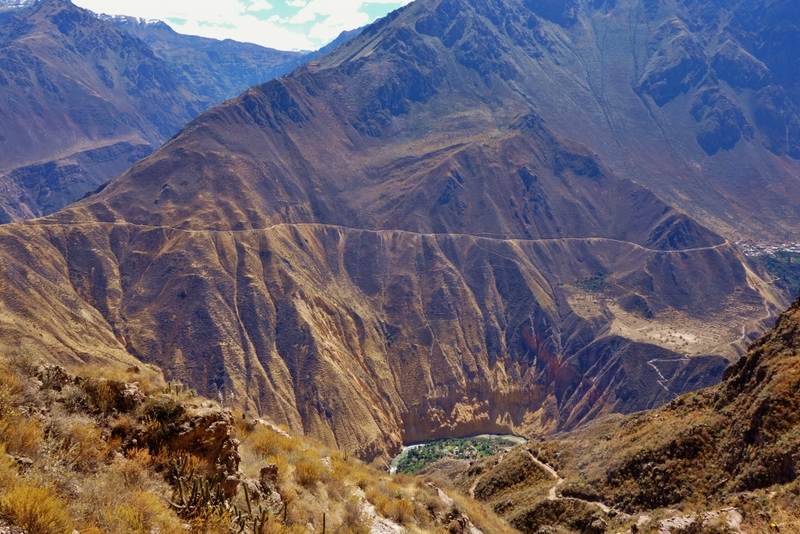 (Only about 20% of Colca Canyon visitors get this far – most only make it to the scenic viewpoint of Cruz del Condor). 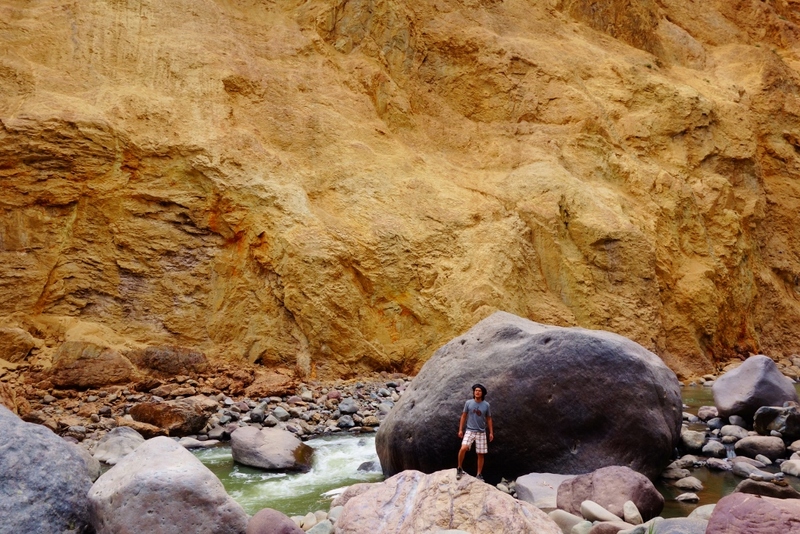 The shortest way to the canyon floor is the 2-3 hour hike from Cabanaconde to Sangalle (aka ‘the oasis’). 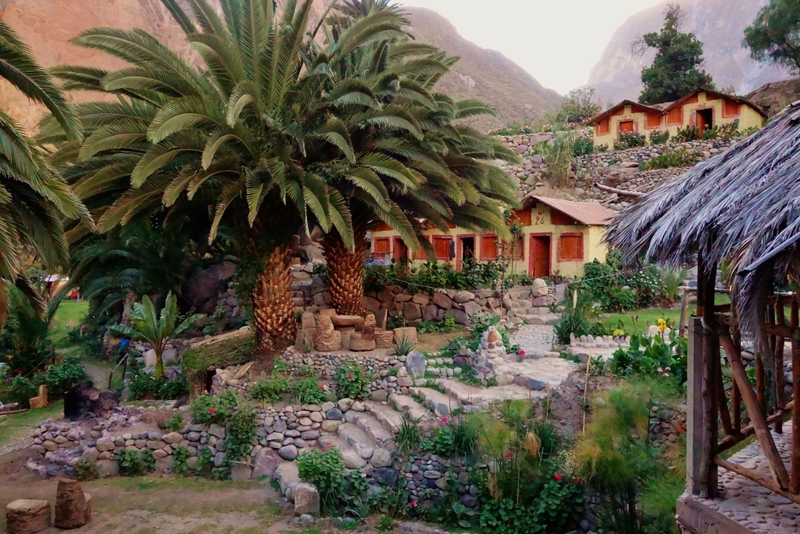 It’s a 1200m descent on steep, zigzagging paths, where upon reaching the bottom of the canyon, you can stay overnight in basic thatched-roof bungalows (S/.15 or CDN $7/pp) or campgrounds. Getting closer to the oasis! After 2.5 hours of watching the oasis grow closer and closer, we finally made it. Sangalle (“the oasis) is beautiful. 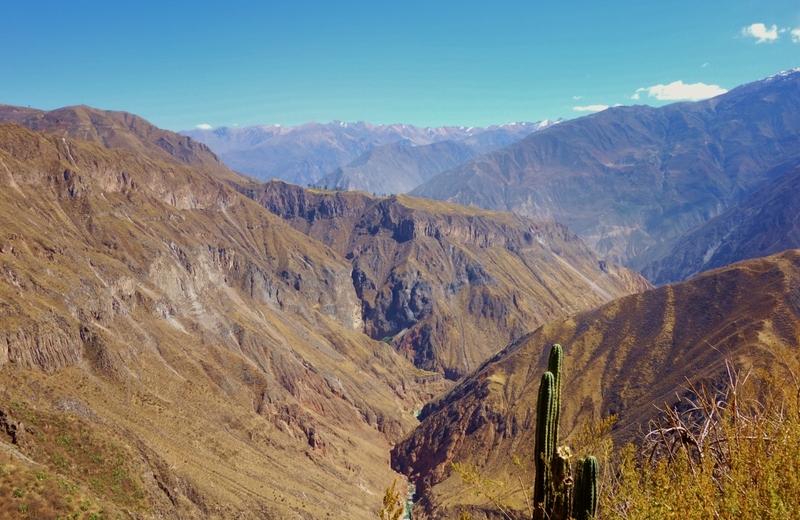 A rich patch of green bound in by the Rio Colca and the sheer canyon walls. The little bungalows we stayed in while in Sangalle. 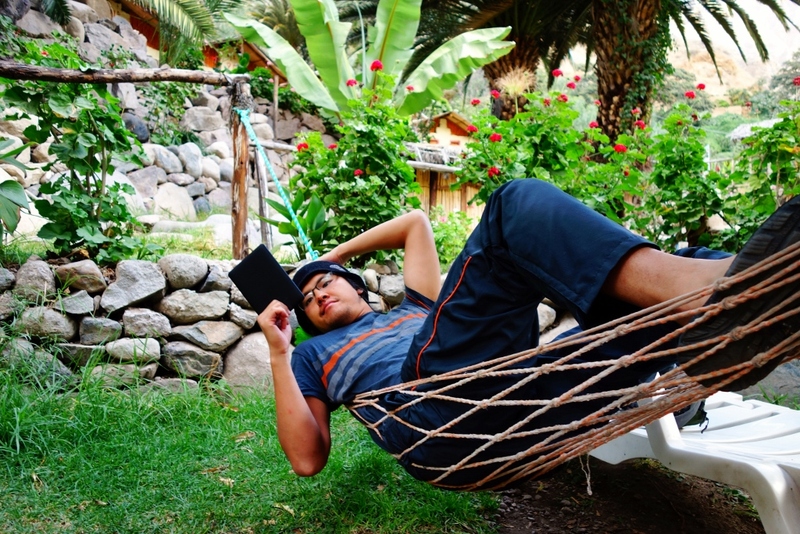 With no electricity, no phones, and no internet access, there was no choice but for us to relax. 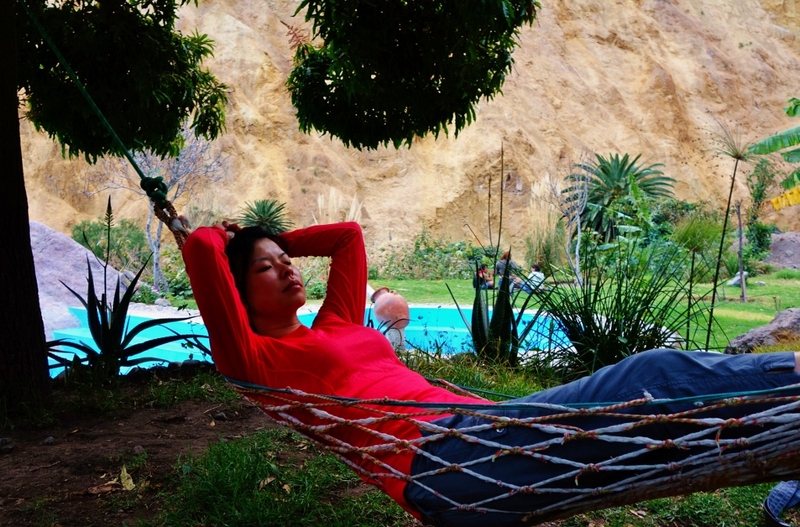 I even finally perfected the art of lounging in a hammock! After a evening of candlelight dining (out of necessity, not romance), card-playing, and star-gazing, we called it a night. The next day, we left around 8am to start the tough climb out of the canyon. We were told it’ll take 3-4 hours, so we wanted to start in the cooler morning air. I’m a slower trekker than Jason, so I decided to get a head start on the trail, while Jason was packing up. As I was climbing up, I noticed that the trail seemed much narrower and steeper than the climb down. ‘How did I climb down this yesterday, with such ease?‘, I found myself wondering. 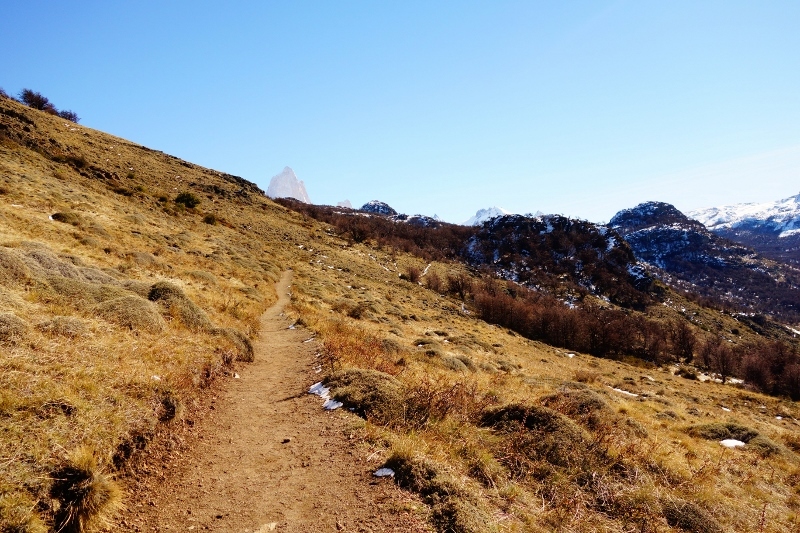 Typically, the climb down requires more concentration than the climb up, since the trail is covered with loose rocks. Any momentary lapse in concentration would likely result in me losing my footing and slipping (not enough to make me fall flat on my arse, but enough to make me concentrate hard for the next 30 minutes). On top of that, (oh, you’re gonna laugh) after we trekked up for about half an hour, I suddenly realized that I had left my iPhone in our bungalow. Back in the oasis. Back at the bottom of the canyon! So Jason decided that I should keep on going, while he turned back around to trek back down into the oasis to get it. He gave all his valuables to me, tied his backpack to a nearby post, and sprinted back down. I continued my slow ascent up the canyon. Every 10 minutes or so, I would turn around and see if I could catch a glimpse of him. Two and a half hours later, I was finishing the last leg of the trek out of the canyon and I still hadn’t caught sight of him. I was really getting worried – until some power trekkers caught up with me near the top and told me that they had seen my husband (i.e. the only other Asian person in the canyon) further down. About 20 minutes after I reached the top, he rounded the corner into view.